This year, High Fives for Hope’s annual 5K will benefit Dante, a six year old boy who beat Acute Lymphoblastic Leukemia. At just four years old, Dante started acting differently from his normal self; he grew increasingly tired. Concerned, his mother took him repeatedly to the doctor before finally getting a call that Dante needed to be admitted into Boston Children’s Hospital ASAP. Shortly after his initial diagnosis, Dante went into remission in March 2013. However, since the ALL treatment plan consists of two years of remission treatments, the battle was not yet over. David describes Dante as a “warrior” who took it all in stride. Fortunately, Dante had his last chemotherapy session last month. 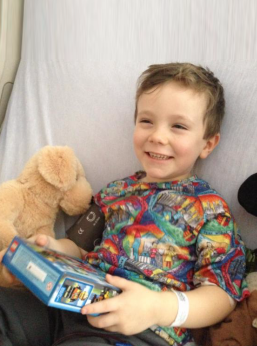 His family has planned a big barbecue to celebrate and enjoy Dante’s recovery. Thanks to cancer research organizations and care facilities such as the Jimmy Fund, Dante can get back to snowboarding, flag football, and Lego. If you haven’t yet signed up for this year’s 5K Race for Hope, please do so today. If you are unable to attend the event, you can still make a donation which will help survivors like Dante.